The Carabiner Pocketknife features straight and serrated blades, Customizable with your logo for Brand Recognition. Provide your business the cutting edge with an ultra-sharp promotion this time! Use the Carabiner Pocket Knife as your next promotional giveaway with your brand details incorporated on it to spread brand awareness. 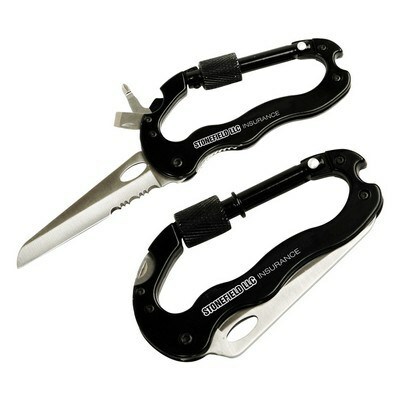 The durable cutting tool comes with carabiner to clip to hiking, camping or hunting gear for ease of access. It comes with multiple tools including screw latch, slide lock blade, flathead screwdrivers and more. Straight and serrated knives combine together in one tool and lock securely to give peace of mind. Impress your adventure loving customers with this unique gift at the next company event.